Ottawa is moving forward with its new tap-and-go smart transit card fare system for OC Transpo, according to the Ottawa Citizen. Following numerous delays and technical hiccups, transit officials say the PRESTO card system is now operating at 99% efficiency. As many as 10,000 Presto cards are to be distributed to students at Carleton University, the University of Ottawa, and Saint Paul University. Other “targeted distributions” will soon follow, with a general release of the cards available at OC Transpo counters and online at prestocard.ca. 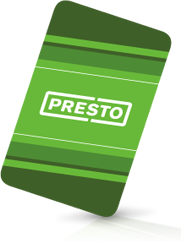 The general public will be able to obtain their new PRESTO card for free online at prestocard.ca on May 18. The card will then be available in various locations across the city, including some libraries, on May 27. The first 200,000 to apply receive their cards for free; and $6 for each applied for after that. Still some minor problems remain including hard-to-read bus-mounted screens which can be hard for the users to read, and it’s not clear when some features the city’s been promised, like self-serve kiosks for putting money on the cards and letting users just tap regular credit cards to pay for transit rides, will work. Those will take a software upgrade that Ottawa will get eventually. The system is anticipated to be fully operational by June 1.